Clinical introduction A 56-year-old man without known medical history was brought to our ED after he was found next to his bed, agitated and with waxing and waning consciousness. He has been bedbound for 5 days after a long-standing period of malnutrition. Physical examination reveals Kussmaul breathing, heart rate of 62/min and blood pressure of 135/100 mm Hg, normal cardiac, abdominal and a non-focal neurological examination other than confusion and altered level of consciousness. An EKG was performed (figure 1). EKG at presentation in our ED. Question What abnormalities are the clues to the severity of his condition? How would you confirm your suspicion? The minimally prolonged QTc time. The subtle horizontal ST segment elevation in V2 and V3. The subtle positive deflection at the J point. 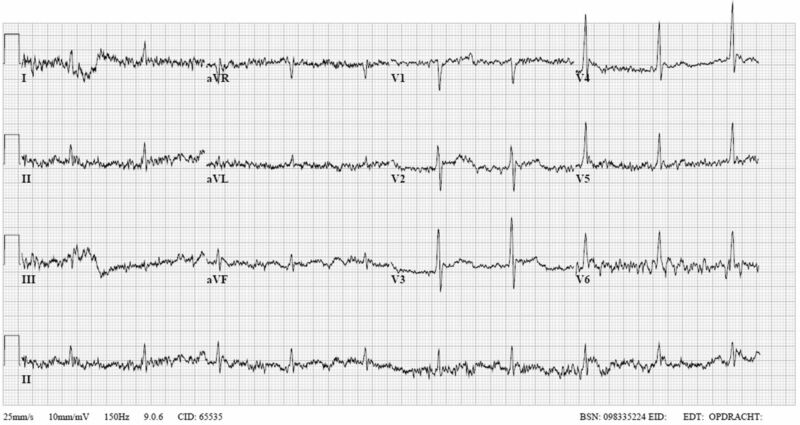 Nothing, this EKG is not interpretable because of the movement of baseline.